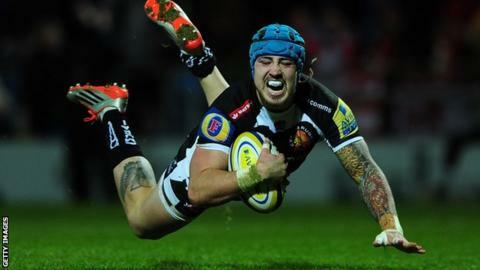 England's Jack Nowell has hit peak form at the perfect time ahead of the Six Nations, says Exeter coach Rob Baxter. The winger, 21, was last week and followed that with a try in the on Saturday. Nowell made his England debut last year and grabbed his only international score so far against Italy in Rome. "It's at this time of year that your big players look at their best and you can see that with Jack," said Baxter. "They want to be involved in the big games and we talked about that before the Bayonne match." Nowell underwent knee surgery last summer, but was for the autumn international series despite having only started three games in six months. With full-back Mike Brown's position seemingly secure, Cornishman Nowell is realistically one of four other players vying for a starting berth in the back three. "Jack is standing out as strong, elusive and of very high quality - he's bang on it at the moment," Baxter told BBC Radio Devon. "He's doing it exactly in the right way if he wants to be an international."